St Benedict’s commitment to social justice calls for us to recognise, appreciate and celebrate cultural diversity. 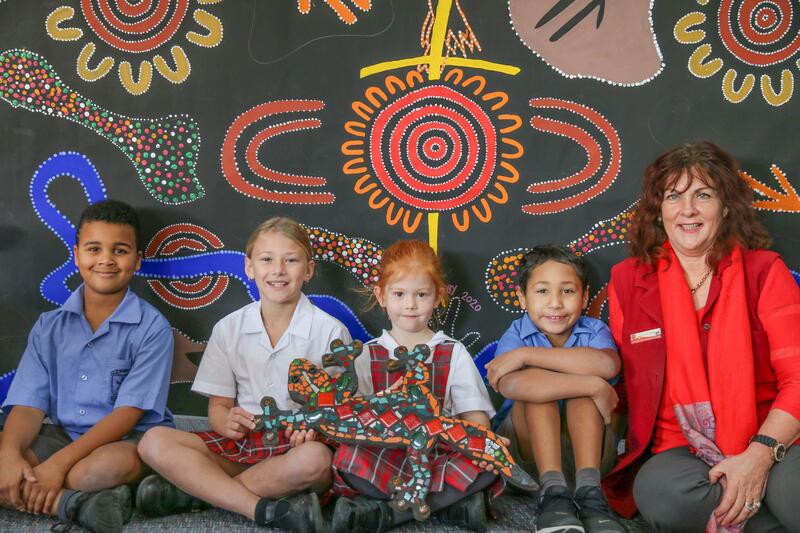 A curriculum that is truly and uniquely Australian provides opportunities for all students to develop knowledge, understanding and appreciation of our Aboriginal heritage. Embracing culture and contemporary issues is an important focus in the classroom. St Benedict’s promotes high expectations of Aboriginal students through quality teaching and learning opportunities. Spirituality is embraced as our Aboriginal students learn and are nourished by this 60,000-year-old culture. We recognise and learn that there are many ‘nations’ of Indigenous families in Australia and that there are many languages, rules and totems. As a Catholic school, the followings and teachings of Jesus Christ is blended with Indigenous beliefs. The Aboriginal teacher and class teacher strives to deliver and promote high expectations of and for Aboriginal students through Quality Teaching and learning opportunities. At St Benedict’s teaching and learning is delivered to all students of all diversity in background through our Key Learning Areas. A particular focus is in Language and Literacy areas which encompasses the Arts, Music and History/Geography. Lesson plans are developed with a strong focus on individual needs and strengths. Students of an Indigenous background are encouraged to involve their families in our special days of celebration in our school. We recognise Harmony Day, Sorry Day, Reconciliation Week and NAIDOC Week. We strive to not be ‘tokenistic’ but rather keep the Spiritual Thread in our school on a daily basis. St Benedict’s is committed to the creation of a school community characterised by acceptance, security, justice, happiness and an environment of growth. In order to provide a supportive learning environment for Aboriginal students, it is important to identify the factors which impact on learning and self-esteem and develop strategies to address the specific needs of these students in our school. Embedding Aboriginal perspective in all aspects of the curriculum. Ensuring we identify, name and acknowledge the traditional custodians of our land. Providing safe and supportive learning environments which enhance the self-esteem and cultural identity of Aboriginal students. Providing curriculum, teaching and assessment programs which are challenging, have high expectations and are culturally appropriate. Providing all Australian students with an understanding of and respect for Aboriginal and Torres Strait Islander traditional and contemporary cultures. Providing intensive literacy and numeracy support for Aboriginal students where needed. Supporting staff to develop knowledge and understanding of the educational and cultural needs of Aboriginal students. Developing Individual Plans and Personalised Learning Plans for Aboriginal students. Strengthening relationships with Aboriginal families and the wider community and looking for opportunities for reconciliation and acknowledgement.